All Massachusetts businesses, facilities, schools, government agencies and even households are affected by Chapter 190 of the Acts of 2006 – An Act Relative to Mercury Management (amended in 2014) – which bans mercury-containing lamps from landfills and incinerators, effective May 1, 2008. Businesses should store unbroken spent lamps in a box or fiber drum labeled “Universal Waste – Spent Fluorescent Lamps,” and keep the container in a secure area. Lamps can then be collected by or delivered to an authorized lamp recycler within one year. Household lamps can be brought to municipal household hazardous waste facilities or retail outlets that choose to accept them. Contact your municipality or use Earth911 search utility to locate a community or retail location near you. Fluorescent, compact fluorescent lamps (CFLs), high intensity discharge (HID) lamps, and some neon lighting lamps contain small amounts of mercury and are identified with the symbol . State law covers all these mercury-containing lamps, including the “low mercury” lamps with green markings. If you choose not to follow these rules, you may be subject to a fine of up to $25,000 per violation per day by the Massachusetts Department of Environmental Protection (MassDEP). 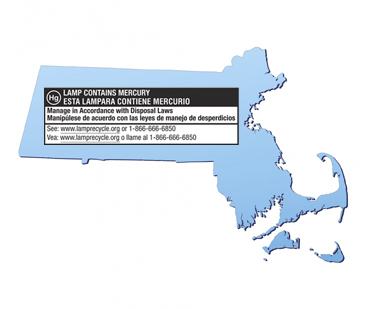 Chapter 196 of the Acts of 2014 – An Act Further Regulating Mercury Management – requires manufacturers of mercury-added lamps for sale in MA to pay an annual registration fee in an amount determined by the MA Department of Environmental Protection (DEP). The law stipulates that this fee cannot exceed $10,000 per company and the aggregate amount of fees collected from lamp manufacturers shall equal $300,000 per year. The funds are to be used by DEP for the limited purposes of department and municipal administration, access, communication, enforcement and education regarding proper mercury-added lamp recycling or disposal. These annual payments are required through 2024. Manufacturers who currently sell – or intend to sell – mercury added lamps in MA should review the statutory changes mentioned above and contact the Division of Business Compliance within the DEP’s Bureau of Waste Prevention.